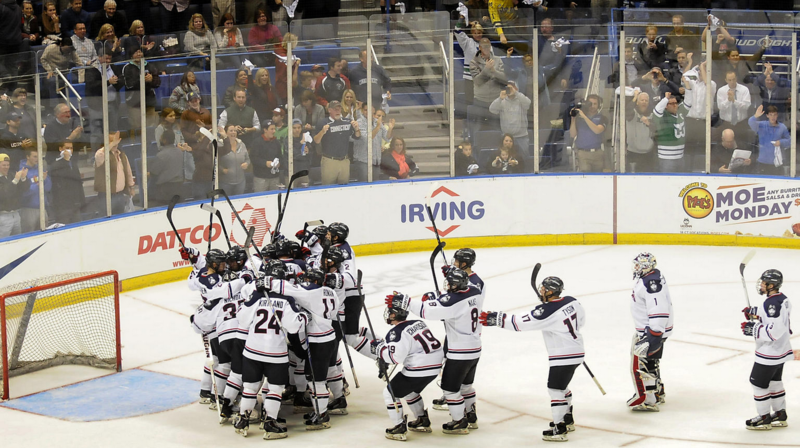 The month of November was one the most exciting UConn hockey has had in a long time. They played their first four home games of eleven they are playing at the XL Center, got their first Hockey East conference win, and played in their first of two in-season tournaments they are participating in this year. 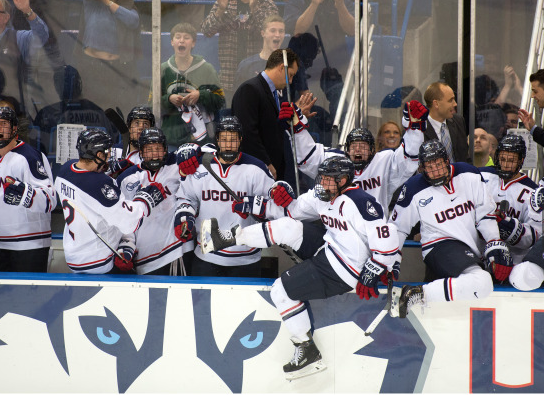 However, what made this month so exciting was it proved that despite being treated as the underdog because it is their first season in Hockey East, the Huskies are now a force to reckoned with and not overlooked. The Huskies started the month by playing in the second annual Liberty Invitational tournament which was played in New Jersey at the Prudential Center, home of the New Jersey Devils. The teams competing in the tournament were UConn, Yale, Princeton, and Merrimack. In the first round UConn was to play conference foe Merrimack and Yale was to play Princeton. The Huskies were looking for revenge as Merrimack had beat them just thirteen days earlier in overtime. The Huskies would get the first goal of the game once again as they also scored the game’s first goal in their previous game with Merrimack. Kyle Huson passed the puck to Jacob Poe who fired a shot on goal that was blocked but Spencer Naas put home the rebound for the 1-0 lead. The Huskies kept the lead and killed off a five-minute major penalty and held an 8-5 edge in shots at the end of the period. In the second the Huskies were pampered with penalties, being charged with six. Merrimack would take advantage and score on the power-play and tie the game. The Huskies were able to kill off all the other five power-plays but Merrimack led the shots in the period 21- 4 and the game was tied 1-1 going into the third. However, the Huskies changed that quickly. Just seconds into the period, UConn dumped the puck into the Merrimack zone and Merrimack goalie Tirreonen came out to get it. He passed the puck out in front of the net but it was picked off by Kasperi Ojantakanen who put it in the empty-net for his first career goal and gave UConn a 2-1 lead just 35 seconds into the period. Just under six minutes later, Merrimack would use UConn’s ninth penalty of the night to score again and tie the game at two each. The two teams would go to overtime but neither scored so it would go to a shootout. Both teams would be denied on their attempts in the first round, but Kasperi Ojantakanen would score in the second round and Shawn Pauly would score in the third round for UConn and Rob Nichols would stop all three Merrimack shots as UConn won 2-0 in the shootout to advance to the championship of the Liberty Hockey Invitational. UConn would play Yale for the title after Yale and Princeton also skated to a 2-2 tie and just like UConn, Yale won 2-0 in the shootout. Merrimack would play Princeton for third place. Merrimack would claim third place with a 6-1 decisive win over Princeton. Later in the afternoon, UConn played Yale for the title game. In the first, Yale dominated play. They scored two goals to take a 2-0 lead and out-shot the Huskies 7-5 after one period. In the second the Huskies played much better, as they finished with a 11-10 edge in shots at the end of the period and got their first goal. Johnny Austin received a pass from Corey Ronan at the blue-line and shot the puck through traffic on goal. Yale goalie Alex Lyon made the pad save but Ronan received the rebound and buried it for his first career goal to make it 2-1 heading into the third period. In the third period, the Huskies had a lot of firepower out-shooting Yale 17-7, but couldn’t score again, as they fell short 2-1, despite out-shooting Yale 33-24. With the loss they claimed second place in the tournament while Yale took home the trophy. Husky Kasperi Ojantakanen was placed on the all-tournament team. With the loss the Huskies dropped to 1-4-2 on the year. The next game was big one, a historic one. 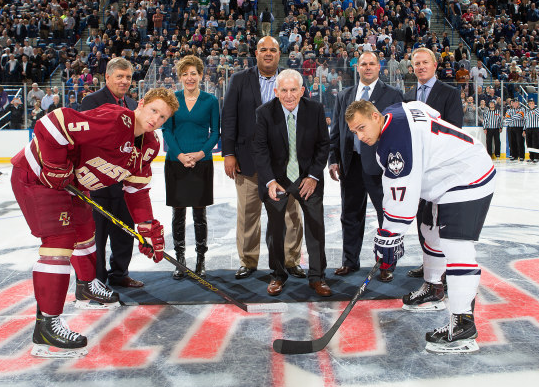 The Huskies were hosting Boston College, who was then-ranked the third best team in the nation, in their first-ever home Hockey East conference game, being played at their new home, the XL Center. Former Husky and Whaler Todd Krygier participated in the ceremonial puck-drop at center-ice. To match fittingly this historic special night, the Huskies were to play in front of a sold-out crowd at the XL Center of 8089 people. This was three times the Huskies previous record attendance. This also broke the record for a Hockey East team’s first home conference game, as the game’s attendance was twice as high as the previous record of a little over 4000. The game itself was just as special and historic. The Huskies came out flying, surprisingly out-shooting Boston College 13-9 in the first period and scored the game’s first goal. Sophomore Evan Richardson found an open lane between two defense-men and skated in on goal and fired a shot past Eagle goalie Thatcher Demko glove-side to make it a 1-0 and throw the sell-out crowd into a towel-waving frenzy. That was the only goal UConn needed. They went on to shock everyone, including Boston College, by winning 1-0. Their defense was what won the game for them. In the last two periods, Boston College out-shot UConn 26-9, but Rob Nichols was incredible stopping every shot, including a breakaway chance, to seal the win and his third career shutout. The win was equally huge because it was their first Hockey East conference win and it came in their first meeting ever with BC. In short, it was a night Husky Hockey fans won’t soon forget. The next game though was a chance to prove the game wasn’t a fluke. They were going to play the Boston University Terriers on the road, a team that was ranked the 5th best in the nation. Things didn’t look promising early as BU scored just 35 seconds into the game to take a 1-0 lead. However, UConn responded only a few minutes later to tie the game. Spencer Naas fired a shot on the Terrier goalie which he blocked with the pad, but the rebound came right to Shawn Pauly, who put it home to tie the game at 1-1. This would be the score at the end of the period. BU would have a 12-8 lead in shots. In the second, play was very even, but BU did lead in shots in the period 11-7. However, this didn’t make a difference as UConn would score the period’s only goal. Shawn Pauly got two shots on goal, but both were blocked by Connor LaCouvee, but the second rebound came right to Trevor Gerling, who banged it home for the 2-1 lead heading into the intermission. Unlike the second, the third period was wild. BU scored 39 seconds into the period to tie the game back up. Just over eight minutes later though the Huskies took the lead back. Trevor Gerling received a pass from Shawn Pauly, stepped around a BU defense-man, walked on LaCouvee, and snuck the puck between his pads to make it a 3-2 game. Sadly the lead didn’t last long, and the Terriers retaliated only thirty seconds later, as the Terriers tipped home a rebound that Rob Nichols couldn’t catch. With under five minutes remaining, BU stunned the Huskies, scoring on a breakaway to take a 4-3 lead. Once again though the Huskies wouldn’t back down, tying it again on a power-play goal. Trevor Gerling got a pass down to Chris Pratt right on next to the goal. Pratt shot the puck, which Connor LaCouvee saved but the shot fell behind him, and Shawn Pauly scored to tie the game at 4-4 with under four minutes to go. The Huskies would hold on and the game would end in this score. 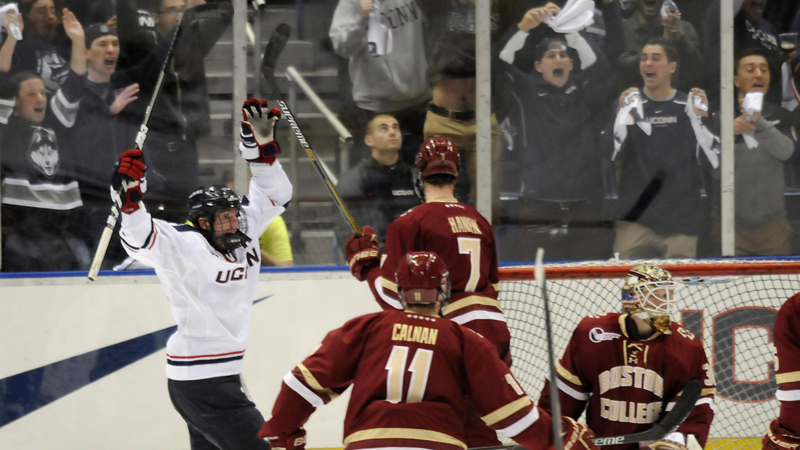 This really proved the Huskies belonged in Hockey East and the win over BC was no fluke. These two upsets shocked all of college hockey. The upsets also gave UConn a vote in the national polls, as they were put at the then-ranked 30th best team in the nation. 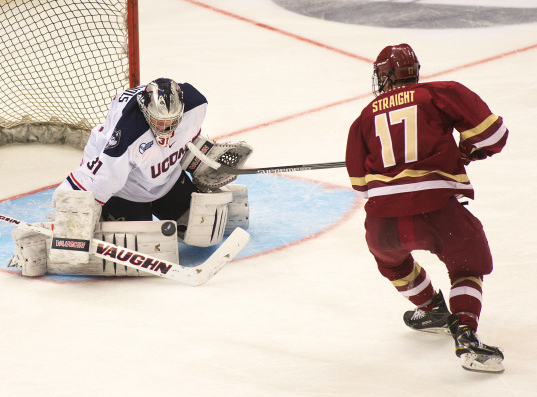 The next weekend the Huskies took on Sacred Heart, a former Atlantic Hockey rival. The game was to be originally played at the XL Center, but was moved to the Taft School’s Odden Rink in Watertown; the reason behind this was to benefit the family of Jason Pagini’s, a longtime coach and hockey advocate, who died in a car crash, with all proceeds from the game going to his family. The game however, was not good to the Huskies. Despite leading in shots at the end of one period 14-9, the Pioneers would get the only goal to go up 1-0. The Huskies continued to pepper Sacred Heart with shots but couldn’t break through the defense. Sacred Heart would tack on an empty-net goal to seal the 2-0 win. The loss was very surprising. Husky players afterwords admitted that the two main reasons for the loss were that the team was still recharging after a hectic week against BC and BU, and for not having the same level of preparation coming into the game as they did for Hockey East games. Only four days later the Huskies opened up a three-game homestand with a Tuesday game against non-conference for RPI. The first period was fairly even with both teams earning a power-play during the period, but neither team could score in the first; the Huskies led in shots 8-5 after the first though. The second period was much more entertaining. The Huskies out-shot RPI 11-9 despite only getting one power-play compared to the Engineers’ getting three. The Huskies would also tack on the game’s first goal. David Drake fed a pass to Joey Ferris who walked around the lead defender and deked around the RPI netminder Scott Diebold and scored to light up the crowd of 3879 fans at the XL Center. RPI however turned up their offense and pressured UConn. Their best chance was when an Engineer got a breakaway but was denied by Rob Nichols; their other great chance was a shot that rang off the post. The Huskies luck didn’t hold up though. RPI got a heart-breaking goal with 2.3 seconds left in the period to tie the game up, 1-1. An RPI blueliner shot the puck on goal but his shot was deflected home by RPI player Melanson. The Huskies came back roaring in the third out-shooting RPI 14-3 but couldn’t score despite some great chances right in front of the net. The game went to overtime where RPI surprisingly out-shot UConn 7-2 but Rob Nichols made all seven saves to give UConn the hard-fought, well-earned 1-1 tie. The next game was against Vermont, ranked the tenth best team in the nation. If you have read my post A Night Out With My Cousins, you know that the Huskies upset #10 Vermont 2-1 in front of 5072 fans at the XL Center. 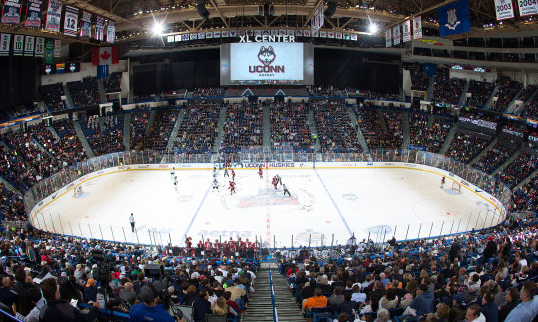 The next day the Huskies welcomed #3 Boston University Terriers to the XL Center for a Saturday afternoon game to end their XL Center homestand. 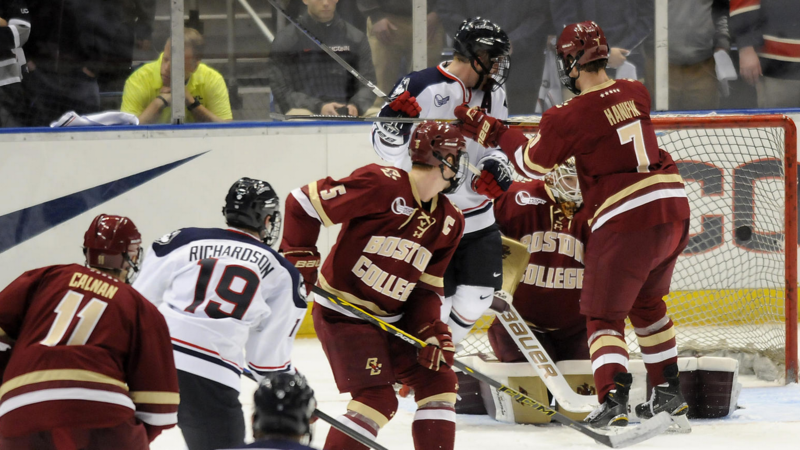 This game against BU, like UConn’s home-opener versus BC was highly-anticipated. 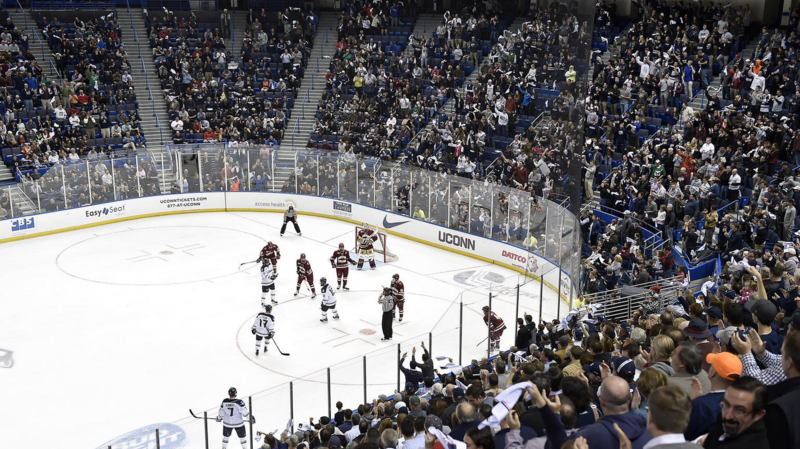 As a result, 7712 fans showed up, the second-highest attendance in UConn Hockey history. The Huskies flew out of the gate out-shooting BU 7-0 in the first five minutes of the game, but couldn’t find the back of the net in that time span. However, soon after BU got a power-play and used this to get their offense going, scoring a goal during the man-advantage. Terrier Jack Eichel fired a shot on goal from the blue-line but his shot was deflected, but the puck came right to another BU player who shot home the loose puck. The rest of the period was even but the Huskies couldn’t score. Hence BU retained the 1-0 lead heading into the second period despite the Huskies leading in the shots, 12-7. In the second, BU scored again on the power-play on another deflected shot to make it 2-0. This stayed the score at the end of the period, with BU leading in shots in the period, 11-5. In the third BU came out firing and scored again making it 3-0, and they looked to be sealing the game. The Huskies had other ideas. Only five minutes later, Trevor Gerling fed a pass to Shawn Pauly who broke around the BU defense for a breakaway, but BU netminder Matt O’Connor made the save. The puck came bouncing to the other side of the net and Cody Sharib knocked the puck into the wide-open goal for UConn’s first goal of the game, making it 3-1. The Huskies scored again just 57 seconds later to make it a 3-2 game. Captain Ryan Tyson fed a pass to Patrick Kirtland behind the net who passed the puck to Corey Ronan in front of the goal and fired a shot by O’Connor to light up the large crowd at the XL Center that had been quiet all night. The Huskies continued applying pressure and had some chances to score but O’Connor denied the attempts. Then BU sealed the game with under three minutes left. Terrier player Jack Eichel skated in on Rob Nichols who made a great save but the rebound was put home to make it a 4-2 game. 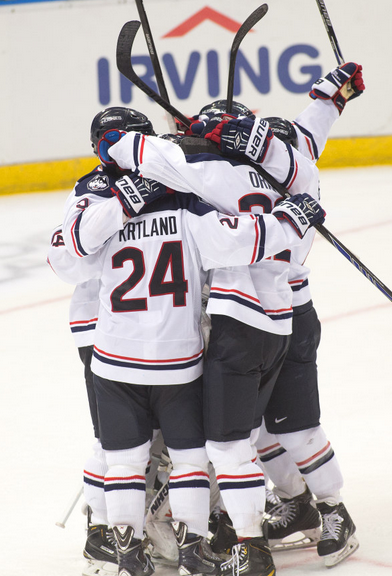 BU ended the scoring with an empty-net goal to seal UConn’s 5-2 loss to Boston University. The Huskies were out-shot in the game 30-22 by BU. It was the Huskies first home loss all season. UConn’s last game of the month was at Brown two days after Thanksgiving. In the first Brown dominated, holding the Huskies to no shots for the first fourteen minutes of the game, and out-shot UConn 14-3 in the period. In the second UConn came to life out-shooting Brown 13-9 in the period and getting some good scoring chances. Their best chance was Patrick Kirtland’s coming in on a shorthanded breakaway, but had his shot just miss wide. Another great chance was when Shawn Pauly split between two defenders but saw his shot denied as well. The Huskies even got a 5-on-3 power-play but came up empty so it was still scoreless heading into the third. Despite out-shooting Brown in the third 9-5, the Huskies allowed Brown to get the game’s only goal. The Brown captain picked the puck off right in front of the net and scored. UConn almost tied the game directly after as Jesse Schwartz deflected a Brent Norris slap-shot but Brown’s goalie, Tim Ernest, made a great save. UConn continued pressure but once again offensive trouble caused their demise in a disappointing 1-0 loss to Brown to end the month of November. The month of November was a huge step forward for UConn. A 2-4-2 overall record doesn’t look great, especially when they were shutout by two easier non-conference foes. However, the Huskies were 2-1-1 in conference play which is incredible since it is there first year in Hockey East, especially when the three teams they played in the month were BC, BU twice, and Vermont, all top Hockey East teams and top-ten teams. However, what really made the month of November great for UConn can be summed up by there accomplishments. They picked up their first Hockey East win, surprisingly in a shut-out win over BC, and BC was highest ranked team they had ever beaten being the third best team in the nation. They had their historic home-opener, which was the game against BC, so this was a huge success since they beat BC. They finished runners-up in the 2nd annual Liberty Hockey Invitational, and tied the 5th-ranked, Boston University at their home, Agganis Arena, a place where BU almost never fails to win. Those are some of the most notable accomplishments of UConn from the month of November. However, the two other main accomplishments of November for UConn are tied to the XL Center. The first was the Huskies have quickly made the XL Center home. They were unbeaten there after there first three games and are 2-1-1 after their first four games there. 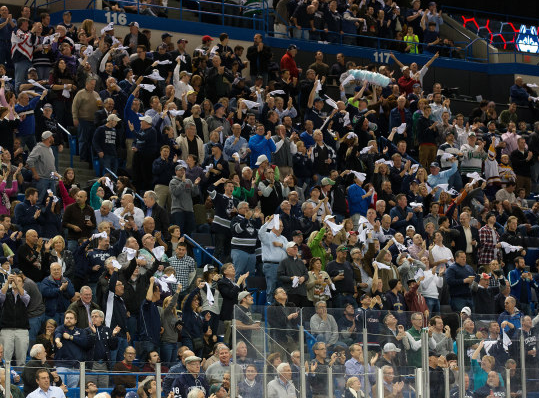 The second is the Huskies’ attendance at the XL Center and fan-support has gone far beyond expectations. They have, in only four games, drawn a total of nearly 25,000 fans to their games there. There average attendance so far is nearly 6200 people a game, the highest in Hockey East which is very surprising, especially when their average attendance was only about 1100 last season. Leaving the month of November the Huskies are 3-7-4 overall, and 2-3-1 in conference play, sitting in eighth in the standings, which is very good and it has surprised many. 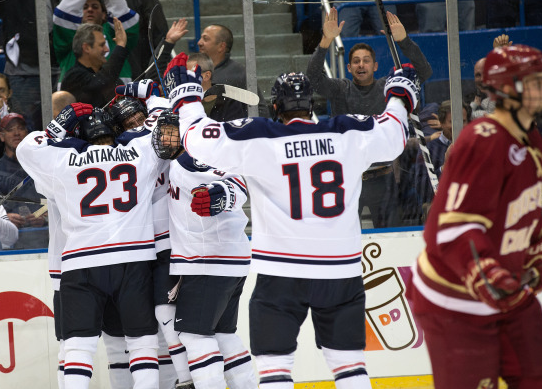 Yes, the month of November proved that UConn belongs in Hockey East, has made a name for itself, can compete and win against top teams, that UConn Hockey is quickly growing a large fan-base, and that UConn Hockey is moving forward to big things.